Cultivating the most capable Burton Cartel takes years in the game, and after a grip of seasons pushing progression, this edition achieves this absolute. Available in two versions, choose the across-the-board compatibility of Re:Flex™ or the ultimate flex and feel of EST® and experience a new era in pro-caliber control. Cultivating the most capable Burton Cartel takes years in the game, and after a grip of seasons pushing progression, this edition achieves this absolute. Available in two versions, choose the across-the-board compatibility of Re:Flex™ or the ultimate flex and feel of EST® and experience a new era in pro-caliber control. The Hinge (on the EST® version only) activates medial and lateral flex for fatigue smoother feel and easier ollies, while AutoCANT cushioning on both the EST and Re:Flex versions equals anatomic comfort. The rapid ratcheting of Double Take Buckles straps in faster so you drop in first. With a moderate flex that doesn&apos;t sacrifice drive, the Cartel is the pro&apos;s choice for mid-range flex and all-terrain versatility. The material underfoot is softer than the material alongside the lateral edges. This creates a ride that is softer underfoot, yet stiffer edge to edge for a perfect balance of response and board feel. 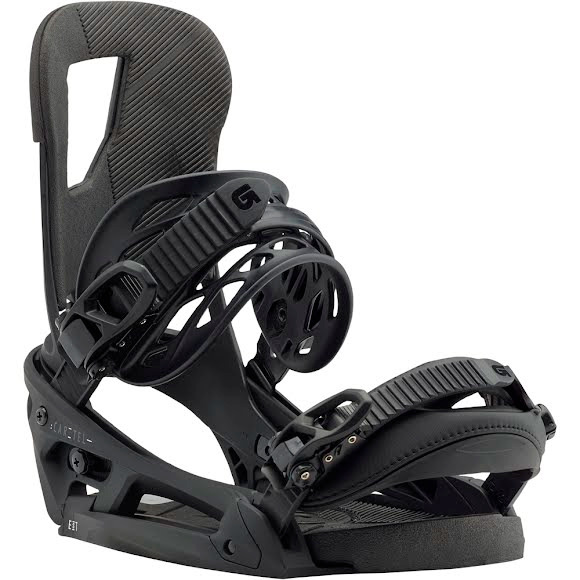 This Burton-exclusive technology utilizes a dual-component baseplate construction that flexes dynamically with your leg for increased foot roll, less fatigue, and easier ollies. Featured on the Diode EST, Genesis EST, Malavita EST, and Cartel EST. The simplicity of a one-piece hi-back means immediate response. Through material blends we then manipulate the overall flex profileâ€”from buttery to responsive. Riders who prefer a more playful and relaxed feel will dig the Zero Forward Lean design on select hi-backs. As always, you can still choose to crank &apos;em forward for quicker control when carving or climbing icy pipe walls. The higher the Forward Lean angle on your hi-backs, the quicker your heel-edge turns. Crank &apos;em forward for icy hits in the pipe like Danny does, or back &apos;em off for jibbing. For mind-blowing micro-adjustability, our MicroFLAD™ systems give you twice the options of our traditional FLAD. Our New Flex Slider makes strapping in a breeze with a strategically stretched hinging zone that allows the heel strap to flex and fall fully open. Thanks to science of forced molecular alignment, the Flex Slider is also stronger. Ultra-Minimized and Fully Injected, Over-Molded Design. Ultra-Durable Glue-Less, Stitch-Less, and PU-Free Construction. 3D Curved, Triple Axis Spine. True Wrap Toe Window. Conformable as Capstrap or Toe Strap. Be the first to drop in with the rapid ratcheting of Burton&apos;s New Double Take Buckles. Helical teeth and a complete rethink of the entire package results in "Insta-Click" immediate engagement, faster uptake, and fewer cranks to tightness. The result: vastly improved strength, speed, and ease-of-use. Dual-density EVA automatically settles your boot into a natural position regardless of stance width or angles for improved comfort, reduced fatigue, and more direct board control. Featured on the Malavita EST, Cartel EST, and Lexa EST.